Chef and The Fat Man: Parramore Too, the way restaurants should be!!! Parramore Too, the way restaurants should be!!! Parramore Too, the way restaurants should be!!! Ordinarily, I wait till a third trip to a dining establishment before I make up my mind as to it’s merits or demerits whatever the case may be but this “mom and pop” tucked away on a little side road in he small town of Blountstown, Fl (35 miles NW of Mexico Beach or 25 miles SW of Marianna, Fl…if this helps) doesn’t need this admirers “third trip” to realize what a GREAT little spot to rest and dine and take some leftovers AND money home with you. Parramore Too was recommended to me by the great folks at another treasure in this small town…Panhandle Settlement…”your hungry Fatman and want good food for a good price try Paramore Too”, I did and the rest is as we might say is histoire! First you must understand this is a WELL KNOWN spot in the REGION, thusly, this establishment that seats probably close to 100 with both sides, kind of off the beaten path is busy…all of the time, my first encounter was on a Tuesday fresh catfish and shrimp special day I drove around the building twice and waited 5 minutes to get a parking spot…it’s one of the locals favorite days. Let’s see I had the special which was 4 nice sized (fresh farm raised catfish fingers, that were more like small fillets, lightly breaded and fried to perfection, two sides, from a list too numerous to mention but mostly homemade(they do as much “homemade” as possible and practicle), dessert, tea (sweet and unsweet with pitchers at the table and the tea was not acidy or skunky like “used” tea can be) oh and hush puppies, and if you choose you may have bread and butter pickles and fresh slices of onion at the table to snack on…and snack on I did. 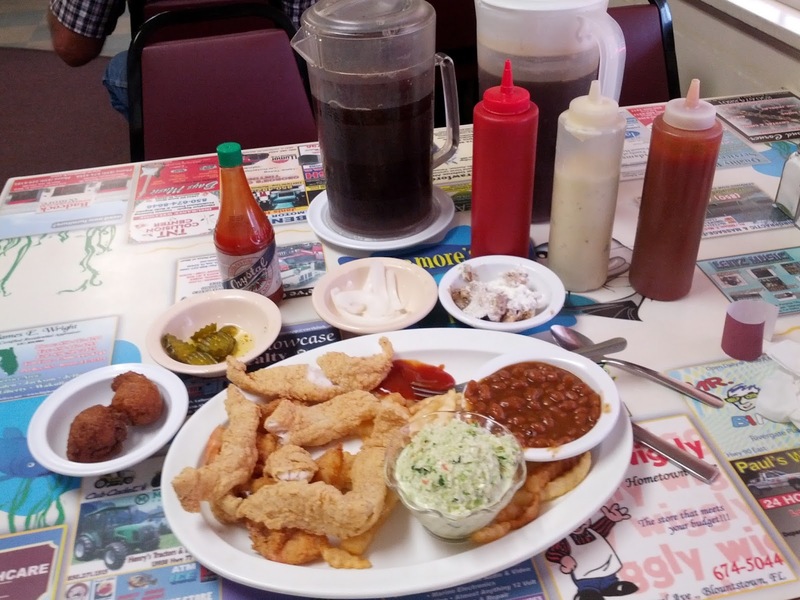 I might mention the price of this midday feast….$5.95, now if you have a bigger appetite you may add half a dozen fresh gulf shrimp or more catfish fillets…I mean fingers for …$2.00…really…I am not kidding and everything was tasty and cooked well. From the time I walked in to this very busy gem I was impressed, the service VERY GOOD, locals that really seem to like to work there the prices way beyond fair with the portions outstanding. The servers were quick, efficient and PROUD of their restaurant and the way they bragged about the restaurant and their food you would of thought they all owned it. My last trip we had Lori as our server and she was just perfect, even though we came in late and they were fairly close to closing, she did not rush us, and all the staff did their closing procedures quietly, efficiently and without making me feel like we were a bother…things just hummed. The second trip was the evening I just mentioned above and we had the special…8 catfish fingers/fillets, two sides, tea or coffee, bread and butter pickles, onions and hushpuppies $10. Yep, that’s it. It was everything the first was but this time I was with the “beast” and she had different sides (cheesy grits, and fried okra) and she was very pleased and really liked Parramore Too (they used to have two locations but they decided to have a bigger one and focus on it and they have and they do!) A simple menu built around the two star items fresh farm raised catfish and fresh gulf shrimp and local seafood when available and for those that don’t like seafood ( which is three quarters of the menu) Parramore Too has steaks, and ham and other country delights with their daily “specials” that really are specials. Open M-Sat for lunch and dinner this is a great restaurant to “drive a little out of the way to try”, but, I warn you this is NOT a restaurant for the “light” eater or nibbler (unless you want to take a whole lot of food home)…this is a restaurant that has the local charm, excellent food, very good service and a ticket that will leave you smiling and telling everyone you know about Paramore Too…but hey, just remember where you heard it first…OK. Just a final note bring CASH as they like Panhandle Settlement are NOT able to process cards…but hey they are local and trusting so they WILL take a check! Parramore Too is truly the way this writer believes a restaurant SHOULD be! Can’t wait to get back…I wonder what the special will be…hmmmmm…..
Panhandle Settlement a true historical treasure! Cedric’s Tavern, what a compliment to Biltmore !